Babblings of a Mommy: NEW E.L.F Jewelry!! Good Morning Chicas! Look at this St. Tropez jewelry collection...looks expensive, doesn't it? Well, it's from e.l.f. so you KNOW they will be priced gooood! They firmly believe in the luxury for less philosophy and with this new jewelry collaboration it's no different. These pieces are sold exclusively through www.shopthelook.net and range from $10-$21!!! Don't want to deal with shipping fees?? 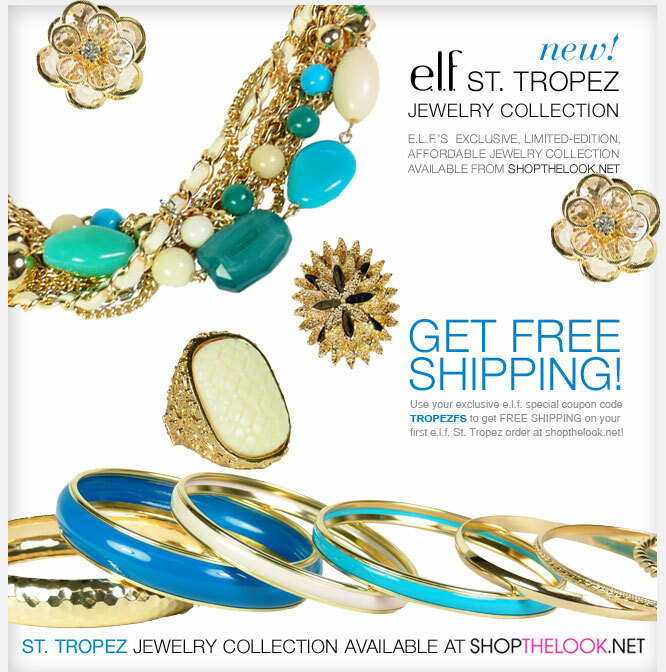 Don't worry from NOW to May 20th use coupon code: TROPEZFS at checkout and get FREE SHIPPING!! What do you think of e.l.f. 's new jewelry collection? Yay or Nay? Let me know! Hi there! I am now following you on Twitter and FB. I will also include a link to your site on my blog! Come visit my online store sometime . . .where I sell handbags, jewelry, fashion and accessories at remarkable prices. All through the month of May, 40% of my sales will be going to the Cystic Fibrosis Foundation. Please share if you would like!